Not as easy as presented. In many cases because the of all the variations it is much better to use the KJV+ to grab the Strongs reference from the NT and then search the LXX+ for the same reference. Then by “accepting” the search results using LXX+ we now have all OT references to use and can now go verse by verse in the OT along side the LXX+ and see associated Strongs Hebrew references. I was using an older version that didn’t have LXX+. Your way is a better way to see all the usages of a word. Obviously, make sure that you are using the latest version of E-Sword, and have downloaded the LXX+ resource. In KJV+ on John 1:1 we see that the Strong’s number for logos is G3056. 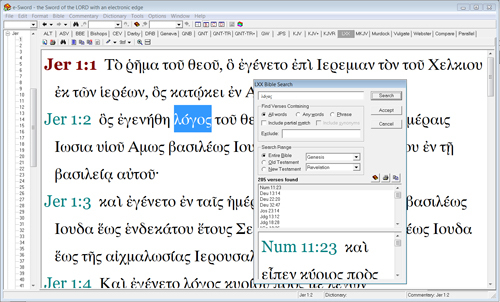 I opened the LXX+ book, opened a search box and typed G3056 in search box in the top left corner. Clicking on the Search button returned that there are 947 usages in all forms of the Greek word logos in 855 verses. Scrolling through the list took me to each verse.